Bees delight in the nectar of this American garden favorite. A lesser known member of the mint family, Bee Balm Mondara, spp AKA Oswego, was a favorite tea of early North American colonists and one taste will make it one of yours as well. Fragrant, aromatic tea recalls both citrus and mint, but with a spicy, musky accent that is uniquely its own. Grow this beautiful and useful plant if you have any garden space, it is not widely available for purchase. The best tea is made from the newest leaves from the top of the plant before it flowers. 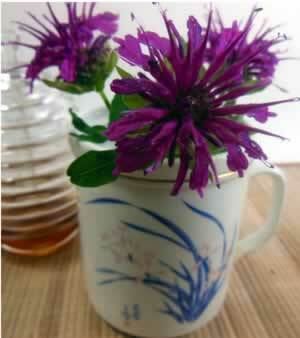 Recipe Instructions: Herbal Tea :Use a handful of freshly picked leaves for each cup of hot water. Chop or cut leaves and infused in hot water until cool enough to drink.